For customers looking to add a beach or marine-inspired feel to their home, nothing says coastal more than art and home décor made out natural driftwood. This recycled décor has a rustic and earthy appeal that os the perfect accent for anyone looking to echo the aesthetic of the beach. World Buyers stocks a wide range of driftwood décor. Find everything from driftwood garlands, driftwood wreaths, wall art and more. Shop driftwood home décor at wholesale prices with us below. A charming gift idea for anyone close to your heart! Handmade of driftwood and has rope hanger for wall display. Warmth of driftwood heart! This is the large size and has wire for hanging. See all our driftwood items to complete a creative beach display. Charming little driftwood heart with open center. Twine rope for hanging. Tie several together one above the other! Hearts come in all shapes and sizes. This heart is "open". Driftwood Peace Sign... Universal message hand crafted with gathered driftwood. Wonderful driftwood trees for table-scape or mantels! Wrap with our Dew Drop Lights for enchanting effect for year-round accent! DRIFTWOOD BACK IN STOCK! This is smaller of the two peace signs with 15.5" diameter. Each is unique and handmade. Heart is made of countless slats of driftwood. Very nice! Unique driftwood tree or imagine dragons! Suggest Western USA shipping only. This is larger box at reduced price. Shipping rate remains the same on clearance items. World Buyers has wonderful, whimsical driftwood gifts in a huge selection. 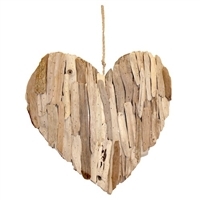 Choose from wholesale driftwood hearts, animals and garlands and more! Driftwood is pleasing to look at with its ocean washed smoothness. See our unique, handmade pieces to enjoy one-of-a-kine selections. No two pieces are exactly alike and each piece of wood has its own sun-bleached color. Complement any room in the house or outdoor space with driftwood designs that add appealing decor accents. Garden and patio are popular spaces to add drfitwood pieces to. You will find here driftwood garlands that will add whimsy to trees in the garden transforming your outdoor areas.